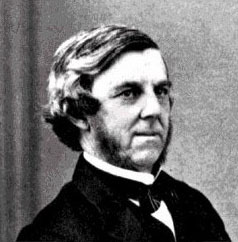 Oliver W. Holmes Sr. (1809-1894). American physician, writer, and poet, Oliver Wendell Holmes Sr. was born in 1809 in Cambridge, MA. He started his studies in law, but soon turned to Medicine, studying part of his time in Paris. In 1843 he joined the fight against "puerperal fever", for which he was mocked, but he stood his ground on principle. A gifted writer, he published several books on essays, biography, and poetry. He was Dean of the Harvard Medical School. He received several honorary doctorates in Law and letters from Harvard and Cambridge. Little known is his contribution to Medicine by the coining of the terms "anesthesia" and "anesthetic", and that he was the father of a Supreme Court Judge, Justice Oliver Wendell Homes Jr. The Journal of Clinical Anatomy published an article on Oliver W. Holmes Sr. profiling his many accomplishments. Original image courtesy of www.nndb.com.